Well hello to you my reader chums! I was lucky enough to visit the legendary city of New York last year and ever since, I keep having to pinch myself. New York is one of those 'goal worthy' places that I never thought would become a reality in visiting. 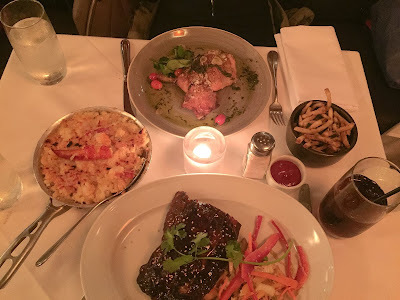 On my five day venture around the city, it's safe to say my sister and I ate as much food as humanly possible, and discovered some of New York's hidden gems. It wouldn't be a trip to New York without tasting their take on classic American pancakes. Out of all the pancakes we tasted on the trip, Lindy's cooked them best. 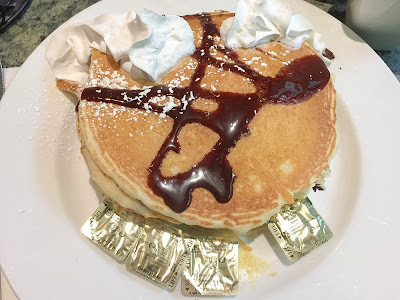 This café/restaurant offered a hefty serving of pancakes - I'm talking five massive pancakes filled with chocolate and topped with chocolate sauce. It's making my mouth water just thinking about it. They also served up waffles, and other traditional American breakfast grub, alongside many beverages. Located on 825 7th Avenue, it's a casual breakfast spot close by to some of the city's attractions. Although it may not be the fanciest breakfast place, it'll certainly fill you up for a while and give the taste of an old school American diner. If you're looking for an Instagram-worthy breakfast café, La Pain Quotidien is for you. As you can tell by the name, it's a French inspired café with a rustic feel inside. I'm talking wooden chairs, wooden tables and waffles served on marble boards - basically a lot of wood. 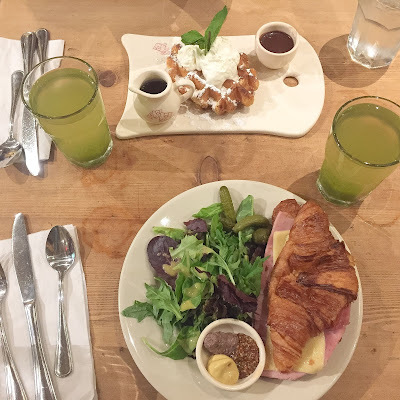 The menu has a variety of healthy and non-healthy options, from green juices, croissants and salads to delicious waffles. There are a few of these cafes across New York: on West Broadway, Grand Street and 5th Avenue. This café feels more like an independent establishment than a chain, considering the quality of the food and how it's presented. If you've done any research into New York bakeries, then I'm pretty sure you would have heard of Levain Bakery. The bakery offers the biggest and gooiest cookies you'll ever taste - and you'll want to eat them over and over again (pictured at the top). The bakery I visited is actually rather small, and usually people are queuing up outside the door as it's that popular with the public. Levain has 4 different locations in New York which gives you more of an excuse to definitely make a visit. There's one on West 74 Street (I visited this one), Fredrick Douglas Boulevard, Amsterdam Avenue and Montauk Highway. Magnolia Bakery had to be one of my favourite foodie stops in New York. The classic-style bakery was combined with all things pastel and had plenty on offer. Whether you're on the look out for cheesecake, a cupcake or brownie, there's a wide variety to pick from. 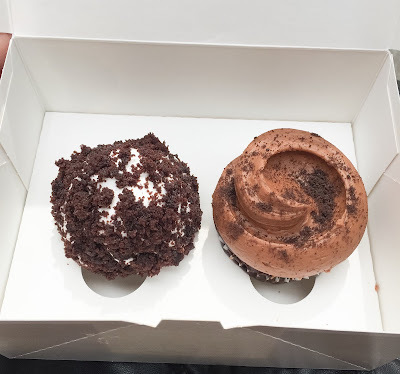 What I love most about the bakery, is it still has that old school vibe with a modern and characteristic twist - and the cupcakes are pretty heavenly too. They have four bakeries in New York: Rockefeller centre (49th Street), Grand Central Terminal, Bloomindales (Third Avenue) and Upper West Side (Columbus Avenue at 69th Street). For any Cake Boss fans, Carlo's Bakery has to be a foodie stop for you on your New York trip. The original bakery is in Hoboken, however there is one along 8th Avenue. The bakery offers all the famous baked goods from the show including lobster tails, cupcakes and plenty of cakes to pick from that it's hard to make a choice! We came across this restaurant on our trip, because we were lucky enough to have it about two blocks from the hotel, and after a rainy day wanted somewhere convenient for dinner. The Capital Grille was more upmarket than we thought with dimmed lighting, fancy menus and fine dining service, however we loved it. The food was a little on the pricy side, but the quality and portion size certainly made up for it. The roast chicken I ordered was massive and our side order of lobster mac & cheese could have been a main dish in itself. Its desserts were on par - and they even offered us freshly baked cookies when waiting for our food. What more could you ask for? For a fine dining experience and some great food, head over to Capital Grille. There's a few in the city, and the branch we visited was located on 51st Street. Little Italy had to be one of my favourite areas of New York to look around. It has that charming Italian vibe about it, and genuinely felt like you were in Italy, especially when it came to the food. 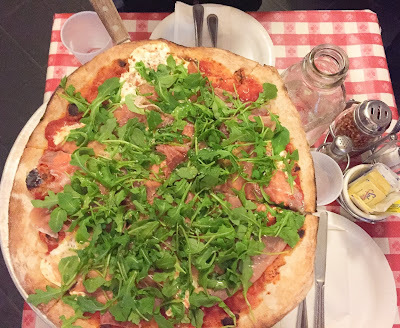 There were many gorgeous looking restaurants in Little Italy serving up classic pasta and pizza dishes, and we chose the famous Lombardi's. They're known for being the first pizzeria in the United States, opening in 1905. The restaurant had a charming appeal and offered a variety of pizzas. Lombardi's made me think of Naples' authenticity and brought back many good memories of dining in Roman pizzerias. For a little bit of a fun restaurant experience, Havana is a great choice. The Cuban style restaurant offers a variety of quirky dishes and cocktails. It was one of those restaurants we found on a whim - as we were soaking up our last few hours in New York, we wanted a bite to eat before heading to the airport and that's when we saw the bright lights of Havana. Their food was superb, and to this day I still can't get over the delicious starter we shared. It was cheesy bread with chicken and a few other toppings. 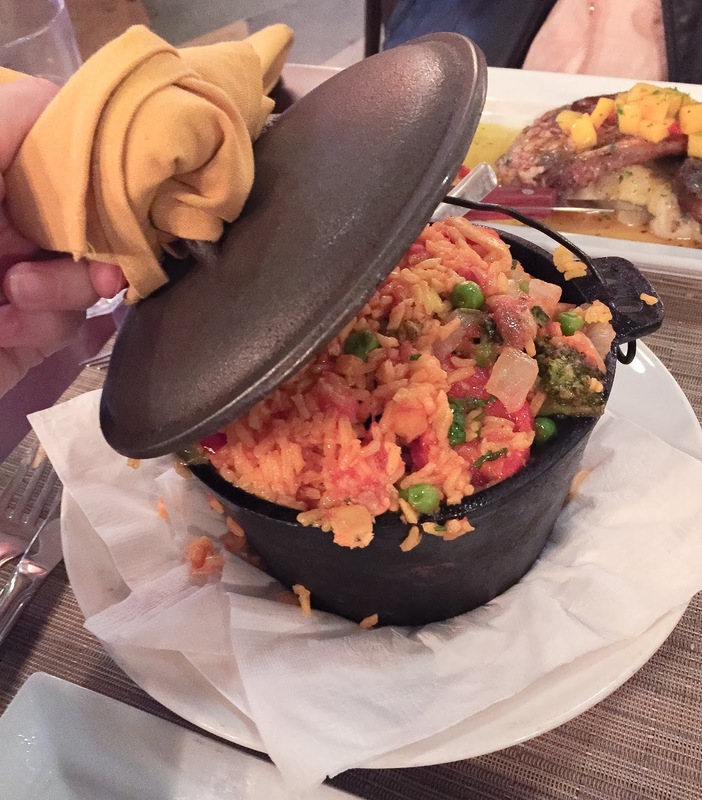 I ordered a vegetable paella and it came in a massive pot, that it should of actually been on the sharers menu - nevertheless I enjoyed it. There are two Havana restaurants in New York, one near Times Square and the other in Ridge Hill. 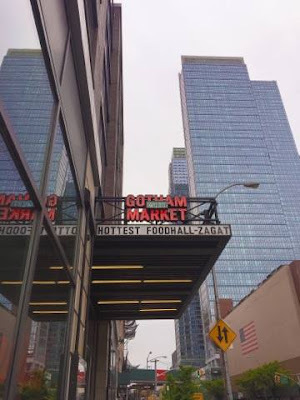 If food festivals or fairs give you a lot of joy then Gotham West market is the place for you. I found this prior to my trip and added to the agenda as I loved the idea behind it. The market has a variety of different food stalls and restaurants, and offers the opportunity to try a bit of everything. It's also indoors so in case the New York weather makes a turn for the worst, you can still dine at the market. I hope you enjoyed this foodie style post. Have you visited New York? All of this food looks so good! Especially those pancakes, it looks like you had a great time! Everything looks absolutely amazing! Lovely collection of places! Everything looked so good and that’s coming from a fussy eater!